Wine enthusiasts will love this vineyard inspired favor. 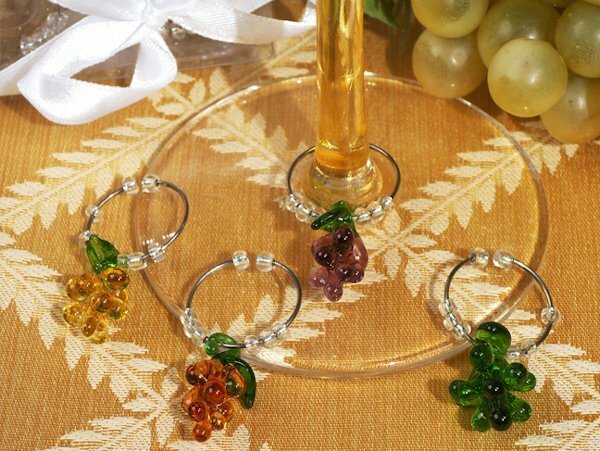 Delicate glass grape wine charms are the perfect way to thank friends and family for sharing in your day. Crafted from Murano-like glass, each grape shaped charm is attached to a chrome ring with bead accents. We package 4 different color charms in a clear plastic box finished with a white satin ribbon for a memorable favor. Each charm measures approximately 1" x 1".